Size: 7.0 x 9.8 inch. (177 x 250 mm). Published in Lemgo 1744. 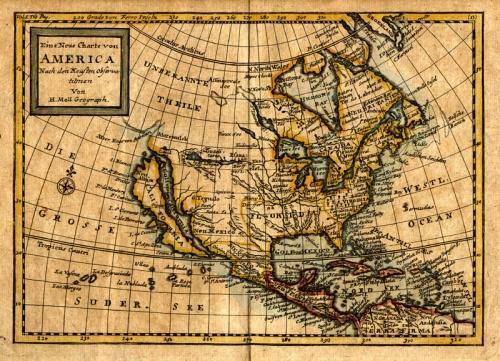 A German text edition of this early map of North America with California as an island on the second Sanson model. The map includes Meer Enge von Annien and the Land of Mozeemlek. This is a slightly later edition of a very popular and a significant map that appeared in Oldmixon's 1708 book, "The British Empire in America" and then in other editions and states and publications to about 1781. From a German edition ''Das britische Reich in America''. Reference: Not in McLaughlin. Paper slightly browned. Dark impression. Very good condition.